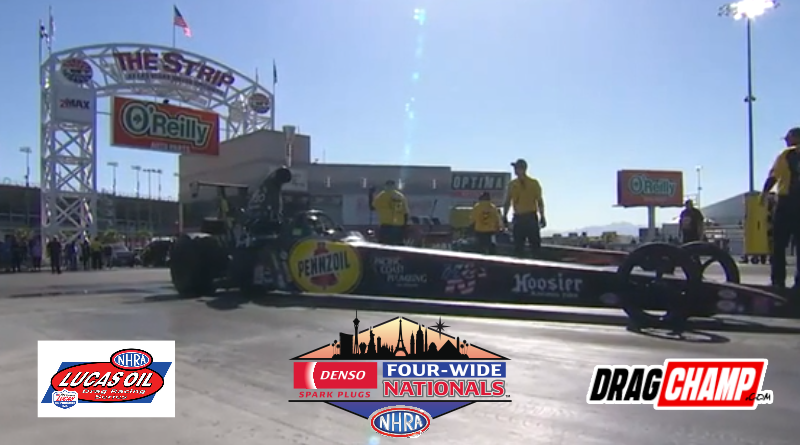 Las Vegas – The NHRA tour returns to The Strip at Las Vegas this week for the Denso Spark Plugs Four-Wide Nationals. Racers attending the nationals will have three straight weeks of racing ahead of them. As the national is followed by the Lucas Oil divisional then the week long Spring Fling bracket race. Continuing the recent trend, almost every sportsman class at Las Vegas is at or over it’s quota. With the low NHRA sportsman class quota’s this season, racers must focus on attending more Lucas Oil Drag Racing Series events in order to attend nationals. This week’s race is a three-day event which includes a compacted schedule. With over 330 sportsman racers in attendance, the racing action will be non-stop this weekend. Racers will be competing seven classes including Competition Eliminator, Super Stock, Stock Eliminator, Super Comp, Super Gas, Top Sportsman, and Top Dragster. With each NHRA national event DragChamp’s sportsman preview includes an overview of each class. In addition, we select the Team DragChamp Picks to win the race. Here are this week’s picks. With one of the smallest fields of the season, there will be no easy outs in Comp Eliminator this weekend. Ralph Paepeghem – After a runner up at the Phoenix national and a win at the Tucson divisional, Ralph is looking to go to make it three straight finals. Justin Lamb destroyed the field last season when he doubled-up with wins in Super Stock and Stock. Justin is always tough at his home track so look for him to go deep again this week. Rick McKinney, runner up at the first two nationals of the season, will be on hand at Vegas looking for his first win of 2019. Anthony Bertozzi – Looking to make it two straight after his Top Dragster win at the Gatornationals. Jackie Alley – Former world champ knows how to get it done. Dan Fletcher – I have yet to cash in when I’ve picked Fletch to win but I think this is my week. He practically owns The Strip. With 68 cars entered, Stock is by far the largest sportsman class at Vegas. The field gets a break this week as defending champion Justin Lamb is not entered in Stock this week. Although, the field is stacked with heavy hitters. Luke Bogacki – Cool Hand Luke will be driving the Lamb family’s Stocker this weekend, could be a killer combination. Brad Burton – Former two-time world champ is always tough. Jody Lang – Jody is no stranger to the Vegas winners circle. Bradley Johnson looks to repeat his outstanding performance from last season but to do so, he’ll have to go through a talented field. Kevin Wright is looking to keep his final round streak alive after a win and a runner up at the first two nationals of 2019. John Labbous Jr. – Lil John started the year strong on the East Coast, would love to add some West Coast hardware to the collection. Aaron Kinard – After his late season championship run came up just short, Kinard will be hungry to start the season strong. Chad Webber – The Division 7 champ knows how to win at The Strip. A deep and talented field awaits the 9.90 competitors in Vegas. With so many big names, it will be difficult to pick a winner. Phil Unruh – Talented racer that can win in any class. Could make moves this week in his supercharged Cobalt. Marko Perivolaris – Marko has been tearing up the West Coast this season. Another national event victory could come this weekend. Craig Maddox – Talented Division 5 competitor could sneak up on the field at Vegas. Bart Smith will be looking to stay undefeated after winning the first two nationals of the year. In addition, Justin Lamb will try his hand at Top Sportsman racing this weekend. Dan Lafferty – Fast bracket racing star would love to collect the Top Sportsman Wally this week. Don Meziere – Meziere is no stranger to the Vegas winners circle. A number of red hot racers will fight for the Four-Wide Wally this weekend in the ultra-quick dragster class. This includes Phoenix winner James Warden who looks to go back-to-back. Zach Sackman – Look for the Winternationals runner up to find the winners circle this week. Thomas Bayer – Versatile racer can drive the wheels off of anything. Should be in the mix at The Strip. And that’s a wrap on the Denso Spark Plugs Four-Wide Nationals Sportsman Preview. DragChamp will have daily updates from each class throughout the weekend.